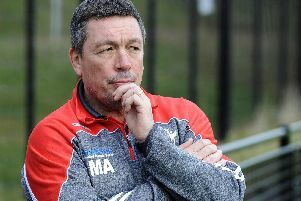 Director of rugby Mark Aston believes that Sheffield Eagles can now start looking ahead to the Championship Shield after all but securing their place in the Kingstone Press Championship. Eagles’ defeat of Oldham at the weekend moved them 10 points clear of the relegation places. It would now take an extraordinary set of circumstances to drag Aston’s side anywhere close to the mire, with the coach now keen to press ahead as they aim to go one better than last season’s final where they were beaten by Bradford Bulls at Odsal. For now the concentration remains on the league, with Aston looking to hit his mini-target of two wins from the final three games against Dewsbury Rams next Sunday. “The victory at the weekend puts a big number of points between ourselves and a number of teams,” Aston (pictured) said. With Bradford looking doomed, Swinton occupy the final relegation place as the division gets set to split into two at the end of Sunday’s game. Aston’s side have significant breathing space which will allow the Eagles to now move their attentions to trying to add some silverware, whilst also keeping an eye on next season. “We have been focusing in just training to get that gap a bit bigger,” Aston added. “The aim now is to follow up and get a performance and a result the week after. Then we can go into the Shield and really have a focus on everybody that we have here. “ We want to try and get to the final again, and this time win it. We dipped at the final hurdle last year after a spirited performance got us there, it would be nice to go one better.